This lil pug is puzzled as to where he fits in this pug puzzle. Hehehe, so very adorable. Just get yourself in there and make yourself fit, that's what I say! Love it! Just do like my cat does and climb on top! woo woo woo! haha! i love this! fantastic illo! Haha! Nice one. Adorable pug puzzle AND a short commentary on the nature of social groups. Well done! Really funny this week!! Thanks for the smile! Thanks everyone! 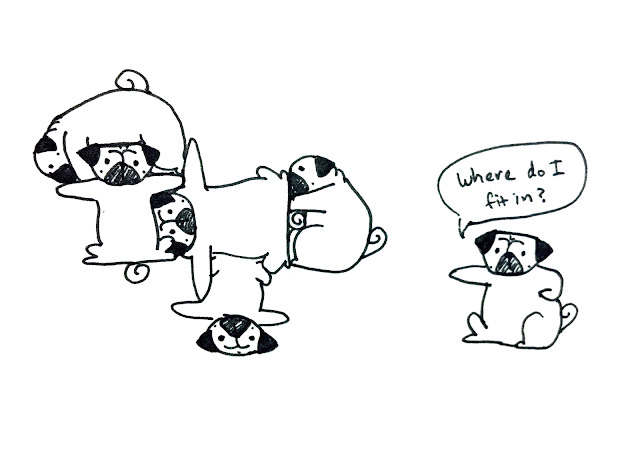 I had a hard time getting the squishy pugs into appropriate puzzle shapes haha!